I'm a graduate student in atmospheric sciences studying Arctic climate. 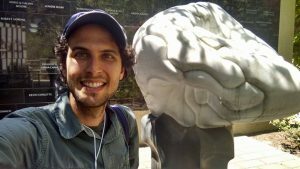 Along with being a host here at Inspiration Dissemination, I'm a Science Communication Fellow at the Oregon Museum for Science and Industry, a member of the OSU Student Chapter of the American Meteorological Society, and guitarist for the band Mons La Hire. Chances are that you, or someone you know, has had lower back pain get in the way of daily life. For some people it is merely an inconvenience, but for many, it is debilitating. In the United States, over 70% of adults suffer from back pain at some time during their lives. Lower back pain is the second-most common reason for missed work, after the common cold. Lost productivity due to lower back pain is estimated to be over $30 billion dollars annually. Out of the myriad causes of lower back pain, one of the most common is degeneration of the intervertebral disk. The intervertebral disk is like a shock absorber between bones in the spine. As people age, wear-and-tear on these disks leads to damage: essentially only children have intervertebral disks without any signs of deterioration. By middle age, lower back pain is sometimes bad enough that people resort to invasive surgeries. 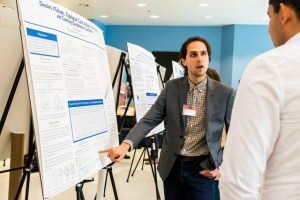 Ward presenting his research at the Graduate Research Showcase, 2019. 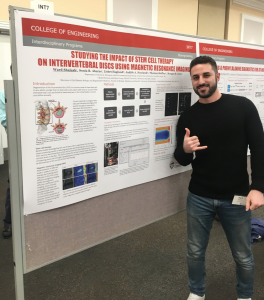 Ward Shalash, a first-year PhD student studying bioengineering with Dr. Morgan Giers, is working to find a better way to treat deteriorated intervertebral disks. Currently, the primary method for treating severe back pain caused by a deteriorated intervertebral disk is to either replace the disk with an artificial disk, or to remove the disk and fuse the neighboring vertebra. Although these methods are effective in relieving pain, patients often need to have the procedure redone after ten years. In addition, particularly for the method where vertebra are fused, patients experience loss of flexibility. In 2003 a new method, cell replacement therapy, was demonstrated on a rabbit. This treatment involves collecting mesenchymal stem cells from a patient (generally from fat cells), and injecting them into the gel-like material in the center of the intervertebral disk. Ideally, this process allows the disk to be restored in place. While this treatment has been applied with some success to human patients, the procedure is not yet standardized or tested well enough for FDA approval in the US. In particular it isn’t yet clear how to determine the number of cells to inject for best results. This is where Ward’s research comes in. “The goal is to develop a method so that doctors can know whether cell replacement therapy will work for patients or not,” said Ward. An intervertebral disk consists of three main parts: the nucleous puplosus, a jelly-like substance in the center; the anulus fibrosus, stiff, fibrous walls around the jelly center; and cartilage endplates above and below. Cross-section of an intervertebral disk. 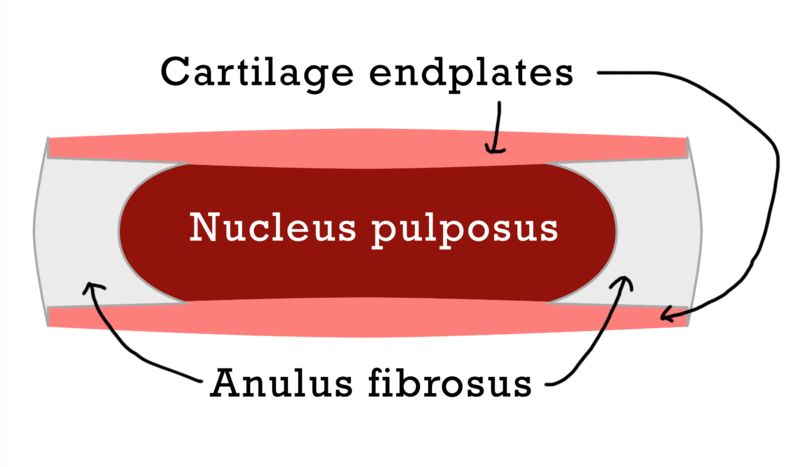 As the disk deteriorates, the gel-like nucleus pulposus leaks into the fibers of the anulus fibrosus. 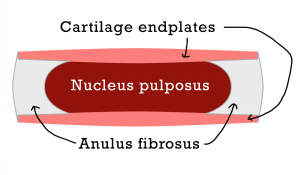 Cells require a supply of nutrients to survive; as there is no blood flow into the disk, cells inside rely on water seeping through the cartilage endplates. Dissolved in the water are nutrients such as glucose and oxygen which are vital for cell survival. 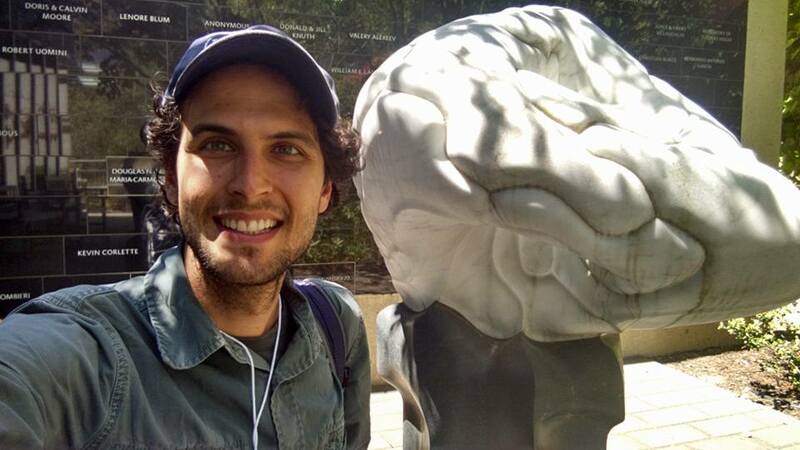 Ward uses a combination of MRI imaging and mathematical modeling to study the flow of water through the intervertebral disk. From this information, he hopes to find a method doctors can use to determine the number of stem cells to inject. Ward hopes that the ability to algorithmically predict the success of treatment this way would cut down the cost of clinical trials. Ward’s parents at the commencement ceremony in 2018. 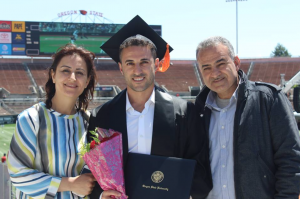 As a first-generation college student Ward mentions that his family’s support was important for him to continue his education towards a PhD degree. 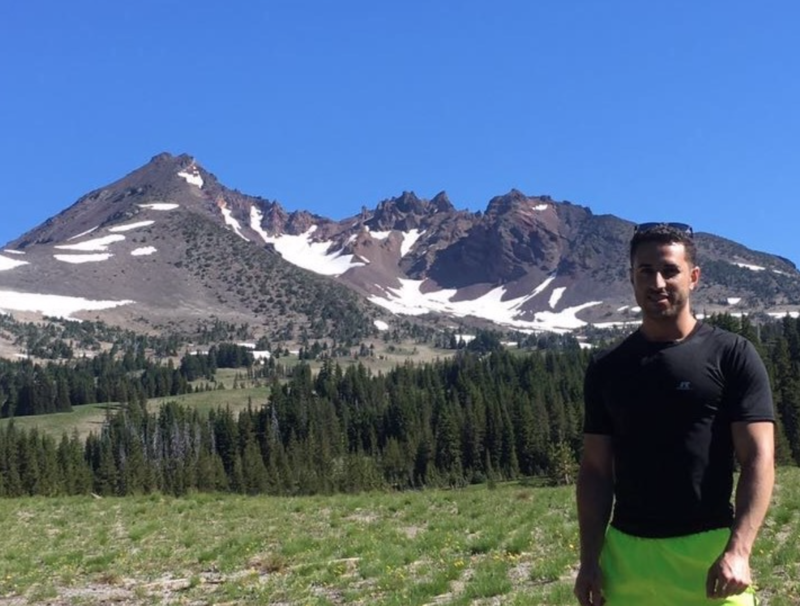 Along with his academic pursuits, Ward enjoys the outdoors, playing the oud, and volunteering. To hear more about Ward’s story and his science, tune in this Sunday at 7PM (PST). You can stream the show live online, or listen to the interview live on the air at 88.7 KBVR FM, Corvallis. If you miss the broadcast, you can also listen to the episode on our podcast soon after the broadcast. In the background is Mt. 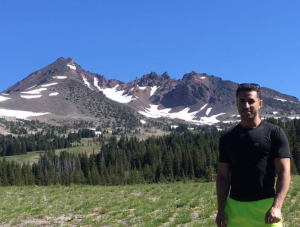 Broken Top in the Deschutes Basin. Despite common belief that PhD degrees are scary and stressful, Ward believes that there is always time for adventures! This entry was posted in Uncategorized on 2019-04-21 by Daniel Watkins. Ashlee Mikkelsen holding a juvenile northern spotted owl. Photo courtesy Ashlee Mikkelsen. For six months out of every year, Ashlee Mikkelsen spends her days hiking for miles off-trail in the Ponderosa pine-filled forests of central Washington, hooting like an owl, and carefully listening for responses. These days, responses can be few and far between. 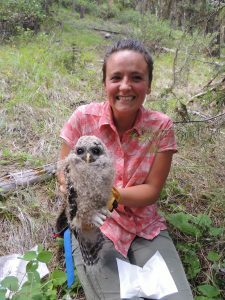 You see, Ashlee isn’t just a wildlife enthusiast; she is a research assistant in a long-term US Forest Service monitoring program focused on the northern spotted owl. Since being listed as threatened by the US Fish and Wildlife Service in 1990, populations of northern spotted owls have continued to decline. In some areas, the number of spotted owls has decreased by more than half in only 20 years (see (Dugger et al. (2016)). 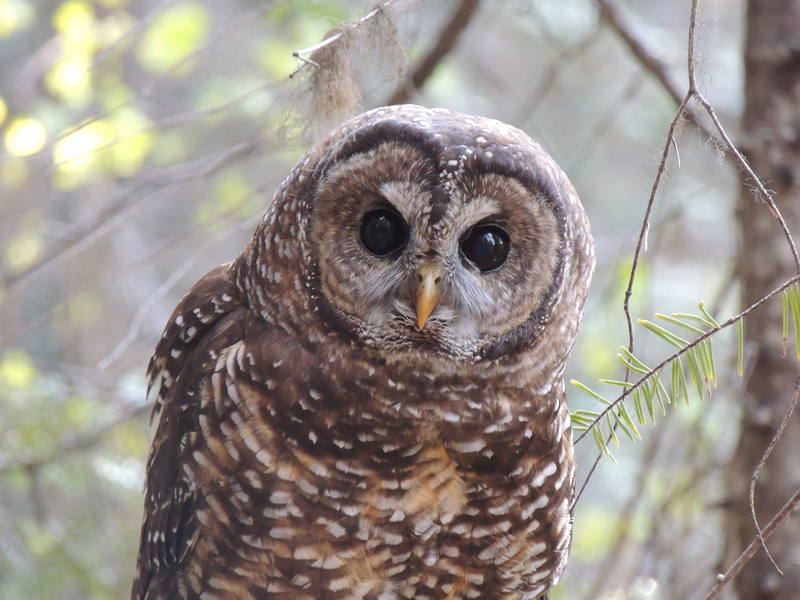 Northern spotted owls are inhabitants of old-growth forests. 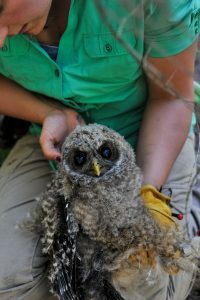 Although northern spotted owls historically could be found in almost every forest from northern California to British Columbia, as forests have shrunk in size through timber harvesting and through changing land use, the amount of suitable habitat has drastically decreased. A second major contributor to the decline of the northern spotted owl is arrival during the last century of the barred owl, which are native to northeastern North America. Barred owls competed with spotted owls for territory and resources, and have been observed fighting with spotted owls. 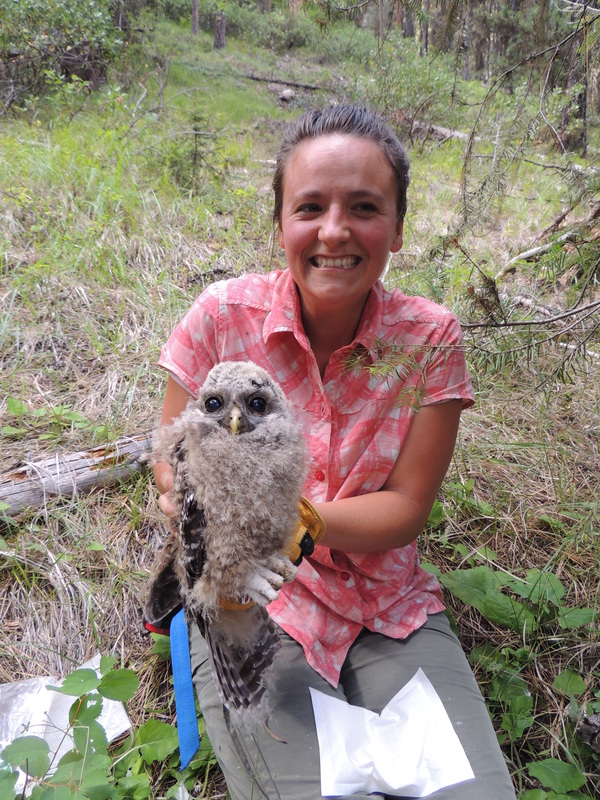 Ashlee’s master’s research at Oregon State aims to quantify the stress experienced by spotted owls. Northern spotted owl. Photo courtesy Ashlee Mikkelsen. When birds experience stress, their bodies respond by releasing larger-than-usual quantities of the hormone corticosterone. Similar to cortisol in humans, corticosterone is always present, but having levels that are very high or that are very low is associated with poor health outcomes. It used to be that in order to measure the physical stress response of a bird, researchers had to take a blood sample. The problem with this is that the process of taking a blood sample itself is a source of stress for the bird. Recently, however, a new technique was introduced based on the fact that corticosterone is also present in feathers. Being able to use feathers is a distinct advantage: birds are constantly dropping feathers, so collecting feathers is fairly non-invasive, and importantly, similar to the benefits of measuring cortisol in hair, feather corticosterone measurements show the average level of the hormone over a long period, rather than just the instant that the feather is collected. Working with professor Katie Dugger (who, incidentally, was Ashlee’s supervisor in the owl-monitoring field crew for the two years prior to beginning graduate school), Ashlee is analyzing a collection of feathers that spans over a 30-year time period. Measuring corticosterone levels in feathers is a high-tech process involving organic chemistry and radioactive isotopes. 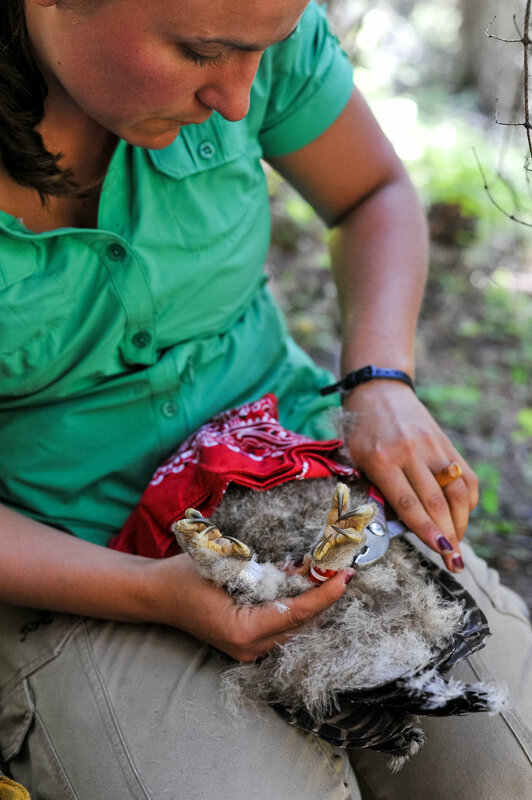 Although there are many complications that need to be accounted for, tracking the levels of corticosterone in these feathers gives Ashlee insight into the impact of stressors such as environmental degradation and competition with barred owls. Because the data spans so many years, she is able to examine the average stress in spotted owls over periods of change in the populations of barred owls. Ashlee’s data shows a strong response in corticosterone in spotted owls when the number of barred owls in the neighborhood goes up. This supports the view that spotted owls’ woes are not just due to habitat loss, but also due to competition with barred owls. This entry was posted in Uncategorized on 2019-02-17 by Daniel Watkins.